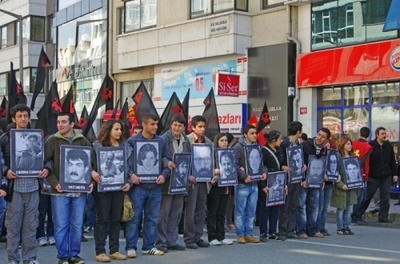 Alevi demonstrators carry portraits of 1993 Sivas massacre martyrs, Kadiköy, Istanbul, March 31, 2012. Much of the world appears seduced by the claims to Islamic moderation of Turkey's Justice and Development Party (known as AKP), led by Prime Minister Recep Tayyip Erdoğan. But Turkish citizens and immigrants in Western Europe seem to be expressing increasing dissatisfaction with the government's policies on religion, the future of the country's secular institutions, and an apparent disregard for the rights of minorities. As Erdoğan approaches the 10th anniversary of his first assumption of the prime minister's post, in 2003, the heterodox Muslim Alevi community, accounting for as many as a quarter of Turkey's 85 million citizens at home and in its large diaspora, is commemorating the 20th anniversary of the Sivas massacre, in 1993. Alevis are a religious movement combining elements of Shia Islam, spiritual Sufism, and pre-Islamic Turkish and Kurdish traditions, including shamanism. They do not pray in the manner of Sunni Muslims or worship in mosques. Rather, their observances are centered on music, dance, and praise of God. Alevi rituals are led by women and the Alevis are known as supporters of gender equality. Islamist fanatics set the Madimak Hotel in the city of Sivas on fire while an Alevi cultural festival, featuring the late author, Aziz Nesin (1915-95) who had translated Salman Rushdie's The Satanic Verses into Turkish, was underway. Thirty-seven people died, including 33 Alevis, two hotel employees, and two among the mob of extremists who had targeted the hotel. Nesin escaped the flames. But in addition to those burned to death, 60 people were injured and 17 more died in demonstrations against the fundamentalist assault. Erdoğan's AKP officials, however, alleging that a 15-year statute of limitations had expired, announced in mid-March that they would not prosecute the accused perpetrators of the Sivas atrocity. Protests in Turkey – and in Turkish immigrant communities, such as that of Bochum, Germany – against the AKP's attitude toward the Sivas affair, reached a high point in Kadiköy, an Istanbul neighborhood on the Asian side of the Bosporus on March 31st. At the call of Alevi community organizations, tens of thousands assembled, holding banners and chanting that "the Sivas case will not be closed until we say so." Turkish officials and media were dismayed at the outpouring of citizens disaffected with AKP. News reports played down the rally, at times referring to it as a "traffic obstruction." By March 28th, the local public prosecutor's office in the interior province of Malatya, south of Sivas, announced that it would commence a new probe into the slayings. The Malatya authorities affirmed that the statute of limitations would not apply in such an instance and that they would begin a long-overdue investigation into the involvement in the fire of Islamist terror organizations. The anger of the protestors, however, was not assuaged by the news. The AKP decision to end the national government's prosecution of the Sivas killers is symbolic of other objectionable aspects of Erdoğan's rule – especially the continuing re-Islamization of Turkish public life. While some refer to the process in Turkey as a "creeping" religious involvement in state affairs, others see the national judicial administration's choice to end the Sivas legal proceeding as an acceleration on AKP's Islamist path. It does not seem coincidental that suppression of the Sivas prosecution by the national officials occurred at the same time that AKP called for an educational reform providing expanded entry of children as young as 10 into the "imam-hatip" schools for Islamic clerics and Friday preachers. In addition, the long-controversial infiltration of Turkish police and judicial structures by followers of Fethullah Gülen, a "soft" Islamist ideologue living in the U.S., is now visible in the Turkish military. The army was once the guardian of Turkish secularism, after the Ottoman empire, with its Islamic foundations, was dismantled in the 1920s. Gülen's movement, which the journalist Ahmet Şik called "the imam's army," aspires to control Turkey's recognized army. Şik, currently under indictment for writing a book about the Gülen phenomenon, has recently been released from detention. The Kadiköy demonstration on March 31 predictably attracted other participants alongside the Alevis. The secularist Republican People's Party, or CHP, were natural allies for the Alevis at the rally. The radical left, represented by the Turkish Communist Party (TKP) summoned its members and followers; they appeared on the streets with red flags. The AKP makes no pretense of resolving the status of the Kurdish minority, and Kurds turned out for the mass meeting. Fans of the Fenerbahçe football club, with its home stadium in Kadiköy, also showed up. But the majority of demonstrators were Alevis. They believe that even before the Sivas prosecution was declared closed, the alleged murderers benefited from protection by the state. The Kadiköy protestors pointed to problems of Turkish society that are ignored by foreign governments and media. Turkey is enjoying a period of economic growth; power has shifted away from the military to civil society, and local authorities have been performing more efficiently on local tasks. These changes, however, have done nothing to help the Alevis. The Alevis continue to be denied recognition in Turkey as a separate religious community. And they are not exempt from harassment. In February, the Alevi community of Karapınar, in Adıyaman province, south of Malatya, saw some 200 homes with the color red marked on their doors. Karapınar has been known for the good relations between Sunni Muslims and Alevis, as well as between Muslims and Christians. While the Alevis feared that the vandalism was a warning of imminent aggression against them, the AKP interior minister, İdris Naim Şahin, dismissed the defacing of Alevi houses as "the work of a couple of kids." But Alevi representative Hüseyin Güzelgül noted that AKP had similarly downplayed the 2005 bombings in southeastern Turkey of a Kurdish-owned bookshop in which two people were killed and five injured. The commander of the army at the time, Yaşar Büyükanit, described one of the criminals in that attack, military non-commissioned officer Ali Kaya, as someone he knew and considered "a good guy." The bookstore bombers, including another soldier, Özcan İldeniz, and a former Kurdish terrorist, Veysel Ateş, were caught at the scene. All three were found guilty early this year and each sentenced to almost 40 years' imprisonment. Alevi leader Güzelgül said, "We want the government to find out who those kids are and who made them mark the homes." For Alevis, the marking of doors in Adıyaman recalled the Kahramanmaraş murders of 1978, when at least 111 Kurdish Alevis were slaughtered in their houses. Witnesses to seven days of bloodshed and butchery in the city of Kahramanmaraş, accused the local police chief at the time, Abdülkadir Aksu, now an AKP member of the Turkish parliament, of complicity in the atrocities. Alevis say a conspiracy of Islamists, the Turkish secret police, and the fascist Grey Wolves movement was responsible. Slowly, the darker chapters in recent Turkish history are being exposed and examined -- the demand of the Alevi leaders, adherents, and cultural figures, such as the prominent Alevi traditional musician Sabahat Akkiraz, who had performed at the Kadiköy event. Erdoğan and AKP, however, seem to feel that ten years in power will provide them with the added strength needed fully to carry out their ideological program. As they have held on to power, their ambitions have grown and become more openly expressed, in their actions on Sivas, the "imam-hatip" schools, and their continued prosecution of the so-called "deep state" within Turkish society. In foreign policy, Turkish officials have been expressing concern for the suffering inflicted on the citizens of neighboring Syria by the dictatorship of Bashar Al-Assad – formerly an Erdoğan ally – and many observers of the Syrian crisis argue that Erdoğan and Turkey could play a positive role in ending the conflict there. Erdoğan, in contrast, seems to be looking at Syria mainly as an opportunity to enhance the AKP's expansionist ambitions for a "neo-Ottoman" revival of Turkish influence in the Arab countries. Erdoğan has, in an ominous manner, tried to equate the Turkish and Kurdish Alevis with the Arab Alawite sect ruling Syria. He has falsely asserted that Kemal Kılıçdaroğlu, an Alevi and the leader of the Republican People's Party, belongs to "the same religion" as the Alawite dictator of Syria, Bashar Al-Assad. But Turkish and Kurdish Alevis, and Syrian Alawites, although practicing variants of Shia Islam, are not the same. They originated at different times and places in history, and their religious views and practices are wholly distinct from one another. Still, Erdoğan appears prepared to employ any form of demagoguery to stigmatize the minority community of secularist Alevis.